An Aftermarket CPU cooler is one of the most essential components of a gaming PC. A stock cooler is only good for basic needs but if you want to overclock your processor for extra performance then you do need a good aftermarket cooler for your budget gaming CPU. Also during gaming, processor can become very hot due to continuous use and to keep their temperature down to safer levels you have to use a good aftermarket CPU cooler. Also some of the unlocked processors come without heatsink and for them you have to buy an aftermarket CPU cooler of decent quality. It is also a good practice to install a good aftermarket CPU cooler for your mid-range to high-end processor even if it comes with a stock cooler. It will certainly increase the life and performance of your processor. An Aftermarket CPU Cooler provides way better cooling performance compared to stock coolers that comes bundled with the processor. Aftermarket CPU cooler can be very expensive depending on their performance especially liquid CPU coolers or CPU water coolers. But there are some budget CPU coolers that provides very good cooling performance and are also easy on your pocket. 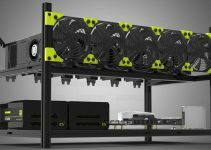 So here in this post I am going to provide to list of best budget Aftermarket CPU Coolers under 50 dollars for both Intel and AMD Sockets (including Socket AM4). But if you are buying an AMD Threadripper or Intel Core-X processors then you have to look for these LGA 2066 & TR4 Socket CPU Coolers. For small form factor mini-ITX PCs, you can have a look at these low profile CPU coolers. Here are the best affordable Aftermarket CPU Coolers for Intel and AMD processors that also supports latest AM4 Socket for AMD Ryzen Processors including both Ryzen 7 or Ryzen 5 processors. These are traditional heatsink and fan (HSF) Air coolers and all of them are equipped with PWM Fan. You can get these below mentioned aftermarket CPU coolers for under 50 dollars. Cooler Master Hyper 212 EVO is the most popular and one of best budget CPU coolers around. The cooler supports all the AMD and Intel CPU sockets. This CPU Cooler also supports the latest AMD AM4 Socket using the AM4 bracket (RR-ACCY-AM4B-R1), for which you have to contact Cooler Master USA. 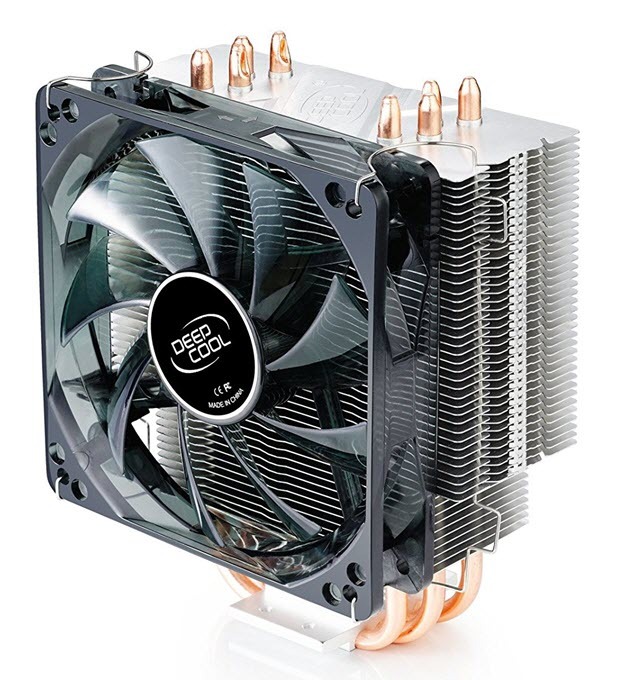 This CPU cooler comes with 4 Copper Heat Pipes which are in direct contact with the processor and each other for better transfer and dissipation of heat. Cooler Master calls it CDC (Continuous Direct Contact) technology. It comes with one 120mm fan which is quiet enough and does a great job in keeping the CPU temperature well below dangerous levels even during CPU load. It has dual fan design which means you can also add another 120mm fan if you want some extra cooling performance. The cooler is a bit taller at 159mm for some mini-ITX or mini-tower cases, so before buying it make sure that fits in your computer case. 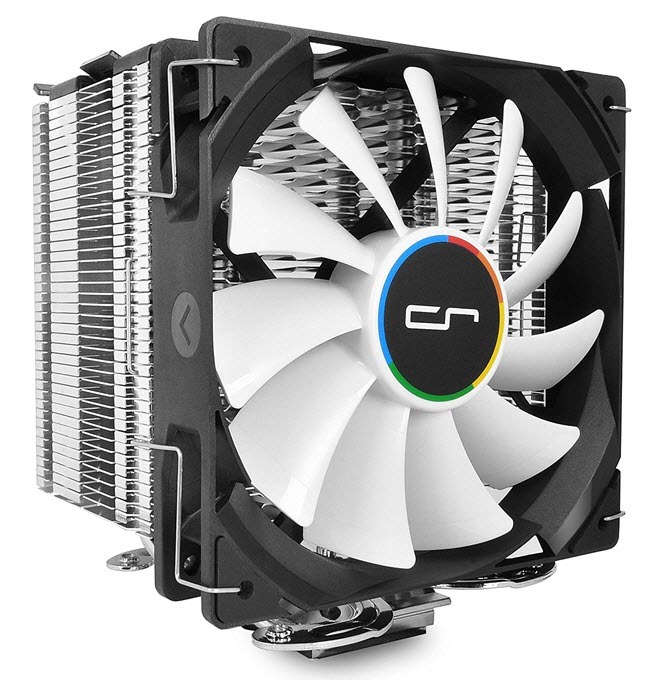 CRYORIG may not be a popular name as Cooler Master but it does offer very good range of CPU cooling solutions. Here we have CRYORIG H7 CPU Cooler which is a very good budget aftermarket CPU cooler and it supports all the major Intel and AMD Sockets (including AM4 using Upgrade Kit). 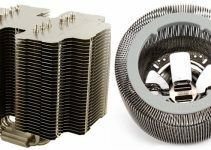 The design of this Cooler Heat Sink features a proprietary Hive Fin structure which allows for a combination of Jet Fin Acceleration and Turbulence Reduction, as well as strengthening structural strength of the fin stacks. 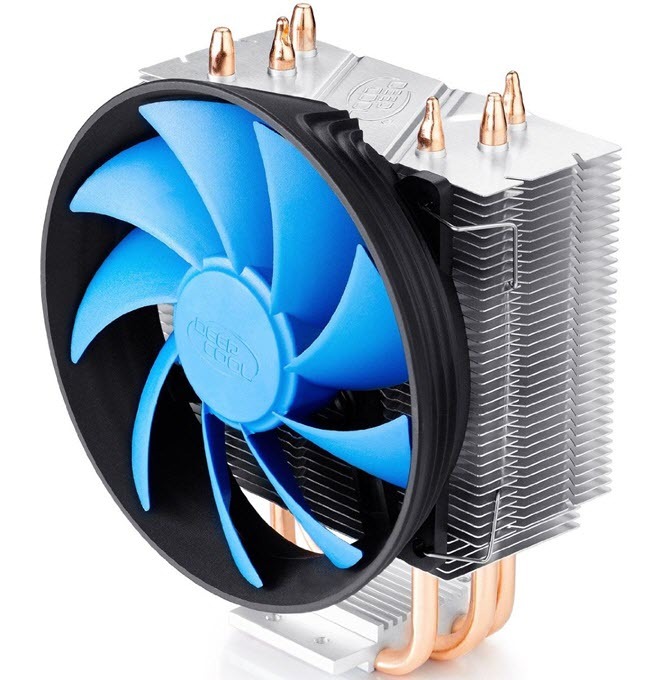 It comes with three heat pipes with copper base and has one 120mm fan which is powerful and quieter too. The other great thing about this cooler is that it has lower height of only 145mm which means it can fit in almost all computer cases including mini-ITX cases. Also, the performance of this CRYORIG H7 Cooler is a bit better than that of CM Hyper 212 EVO, and is also known as Hyper 212 EVO Killer by some. Highly Recommended by me. The most popular budget CPU cooler of all time i.e. Cooler Master Hyper 212 Evo has just got even better with the release of new Cooler Master Hyper 212 Black Edition CPU cooler. This is more of an improved version of Cooler Master Hyper 212 Evo that comes with some additional features, new fan and a totally new installation system. As the name suggests, the CPU cooler is painted all black that features anodized gun-metal black with brushed aluminum surface finish to the top cover for a more refined look. The black color also helps in better heat dissipation and thus improves on performance. This CPU cooler comes with a new 120mm fan which is Silencio FP120. This is a silent 120mm PWM fan that spins at speed in range of 650 – 2000 RPM and generates static pressure of 2.9mm H2O, airflow of 42 CFM and has got maximum noise rating of 26dBA only. The cooler has got four copper heatpipes with Direct Contact Technology and provides effective and excellent heat dissipation. The CPU cooler is as tall as Hyper 212 Evo which is 159mm. One more great thing great about Hyper 212 Black Edition is that it is super easy to install, which is not the case with Hyper 212 Evo. It supports almost all the major CPU sockets including AMD AM4 and Intel LGA 2066. 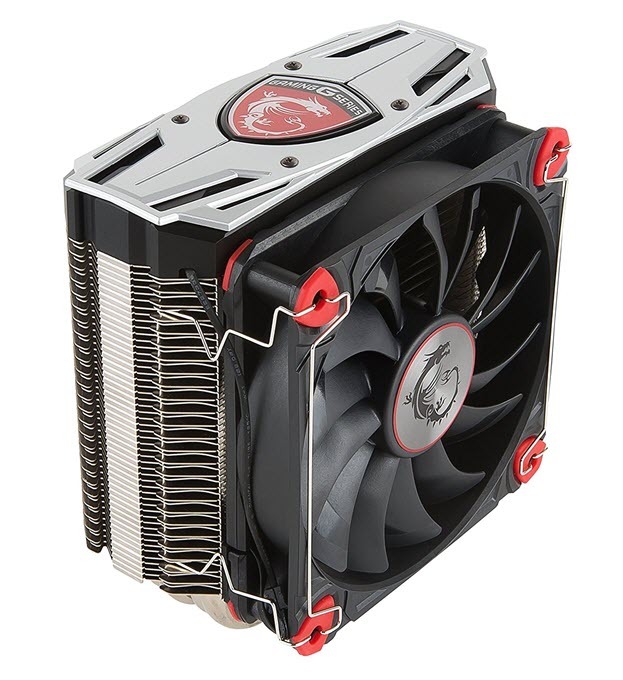 So, if you are thinking of getting a Hyper 212 Evo then my advice to you is to get this one instead. Highly Recommended by me. 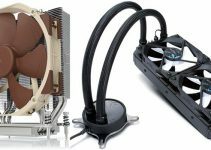 Arctic Freezer 33 eSports ONE is a budget high-end CPU cooler under $50 that supports CPUs up to 200W TDP. It supports majority of the present-day Intel CPU Sockets and AMD AM4 Socket. The heat sink is painted black with a special thermal coating for better heat transfer. There are four copper heatpipes having direct contact with the CPU for an efficient and better heat transfer and dissipation from the CPU to the aluminum heat sink fins. The CPU Cooler is equipped with a 120mm PWM BioniX Fan that has wide range of speed variation ranging from 200 RPM to 1800 RPM. The fan has got Fluid Dynamic Bearing and is very silent in operation even at high loads. Rubber padding on all the four corners of the fan also helps in minimizing the noise and vibration to almost non-existent. This CPU cooler is 150mm tall can fit in most of the tower cases. The performance of this CPU cooler is great compared to the stock CPU coolers and you can overclock your CPU a bit on this cooler. It is available in four different colors that include red, white, green and yellow, and comes with a huge 10 years warranty under its belt. Highly Recommended by me. This is stylish and modern looking CPU cooler form the house of MSI. MSI CORE FROZR L CPU Cooler supports all the major Intel and AMD Sockets including AM4. The cooler comes with a sufficiently large heatsink with nickel plated copper base plate and four heat pipes. The cooler is accompanied by a high performance Premium Thermal Compound X for efficient transfer of heat from the CPU to the heat sink. MSI CORE FROZR L comes with 120mm TORX fan for increased cooling performance and super silent operation. 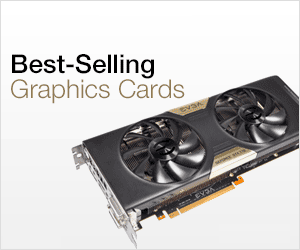 You can find MSI TORX fans on their mid-range and high-end graphics card cooling solution too. The heat sink has dual fan design which means you can add another 120mm when your require more cooling. The performance of this MSI Cooler is amazing and it can easily handle high-end processors from both Intel and AMD. Cooler Master MASTERAIR MA410P is a budget RGB CPU Cooler under 50 dollars. It is one of the latest CPU Air Coolers from Cooler Master and it supports variety of Intel and AMD Sockets including AMD AM4 and Intel LGA 2066 Sockets. It is the upgraded version of the MasterAir Pro 4 CPU Cooler from Cooler Master. 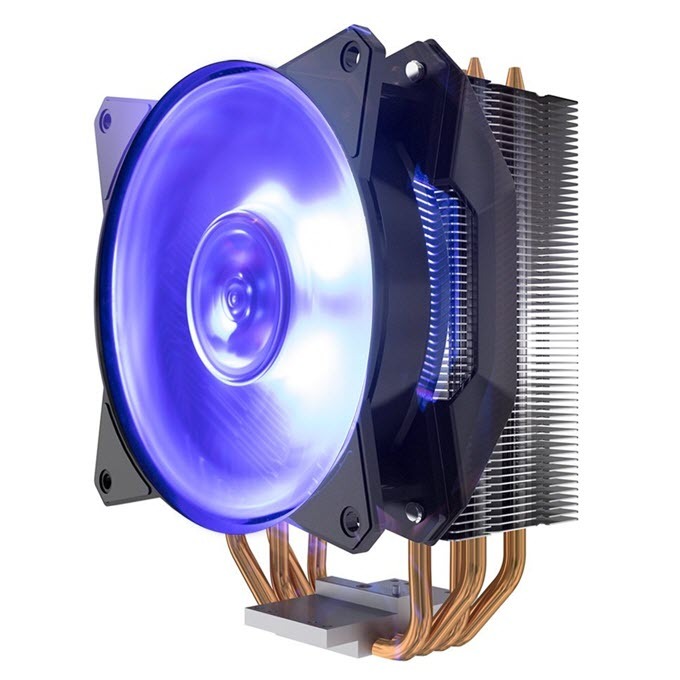 Cooler Master MASTERAIR MA410P RGB CPU Cooler comes with a 120mm RGB Fan (PWM) and four copper heatpipes that have direct contact with the CPU, which Cooler Master calls Continuous Direct Contact Technology 2.0 (CDC 2.0). You can also install another fan to it if you want to increase the cooling performance and airflow. The airflow provided by the single 120mm fan is 66.7 CFM (Max). This budget RGB CPU Cooler is a bit on the taller side having total height of 158.5mm. The performance of this CPU Cooler is pretty good but it can be loud at full fan speed or load. It comes with a wired RGB Controller (C10L) by which you can change the various RGB lighting modes and effects. The CPU Cooler is pretty easy to install and it comes with all the necessary mounting kit brackets for both Intel and AMD processors. It is compatible with Asus Aura Sync, Gigabyte RGB Fusion, MSI Mystic Light Sync and ASRock RGB LED. So, if you are looking for stylish, attractive and cheap RGB CPU cooler that is high on performance and features then you should totally get this. ARCTIC is an renowned company that specializes in cooling solutions for both Graphics Cards and CPUs. 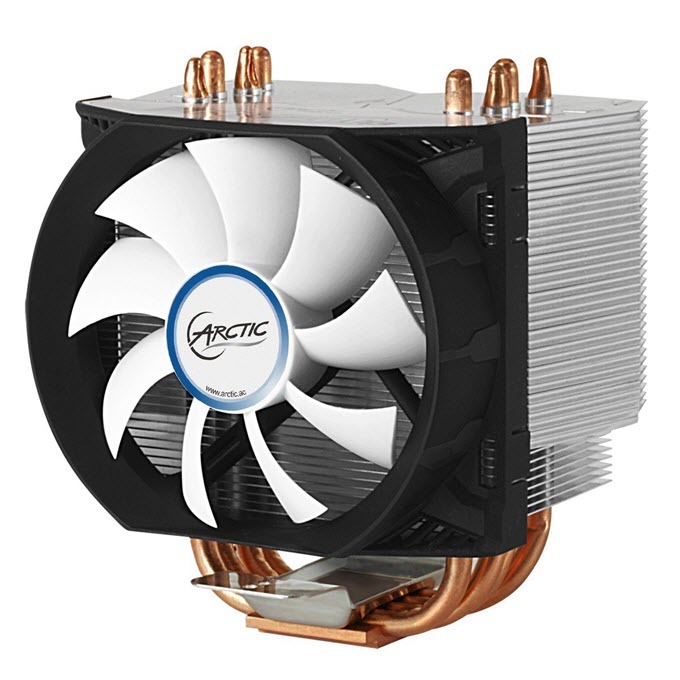 Here from Arctic we have ARCTIC Freezer 13 which is an affordable and high performance CPU cooler. The cooler supports virtually all the Intel and AMD CPU sockets that include AM4 Socket too for AMD Ryzen processors and AM4 motherboards. 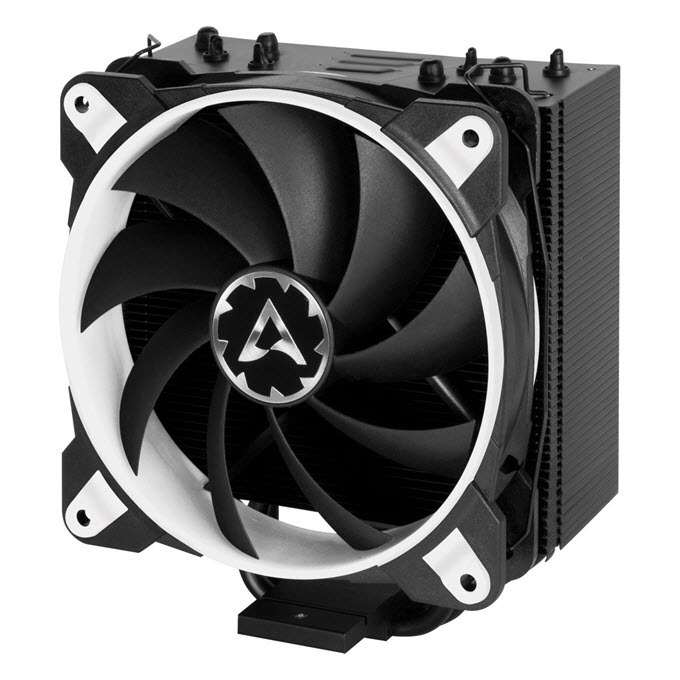 ARCTIC Freezer 13 comes with a relatively large 45-fin heatsink and a 92mm fan which is super silent in operation. In fact this is one of the quietest CPU coolers that you can find in the market. 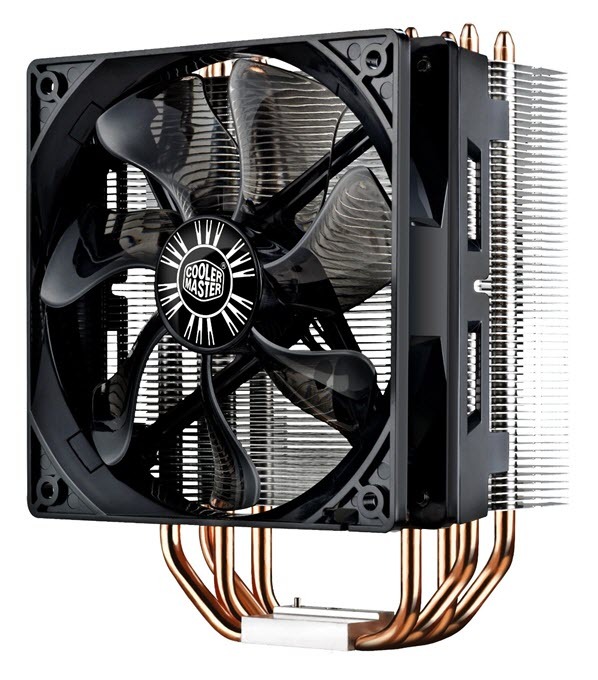 The cooler also comes with four copper heatpipes that are connected to the CPU with a large copper base. The performance of this CPU cooler is top notch and you can easily overclock your processor to decent levels without any fear. Also the cooler is very easy to install compared to others. The cooler has height of only 130mm which means it can be fit in compact as well as tiniest of cases including mini-ITX ones. Highly Recommended by me. This is one of the cheapest CPU coolers that you can get for your Intel or AMD processor. It also supports latest AM4 Socket for AMD Ryzen processors and motherboards. This CPU Coolers resembles the looks of Cooler Master Hyper 12 EVO and it comes with one 120mm fan and 4 copper heatpipes that are in direct contact with the CPU. The fan is relatively silent and comes with a fancy blue LED that looks cool in dark. This cooler is on the taller side with height of 155mm. The performance of this cooler is way better than the stock cooler. So if you are on tight budget then Deepcool GAMMAXX 400 CPU Cooler will not disappoint you. Recommended for budget users. Another very good value for money CPU cooler from Deepcool that has good performance and supports almost all CPU Sockets including latest AM4. This is a relatively small cooler at only 136mm in height but it does not disappoint on performance on stock speeds. Deepcool GAMMAXX 300 CPU Cooler comes with a single 120mm PWM fan and 3 copper heatpipes that remains in direct contact with the CPU for better heat dissipation. Deepcool calls it as CTT “Core Touch Technology”. This is a very silent CPU cooler and is way better than your stock cooler. It is very affordable and you can get it under 25 dollars which is dirt cheap. Highly Recommended for users with mini-ITX cases or who are on tight budget and want performance better than the stock cooler. 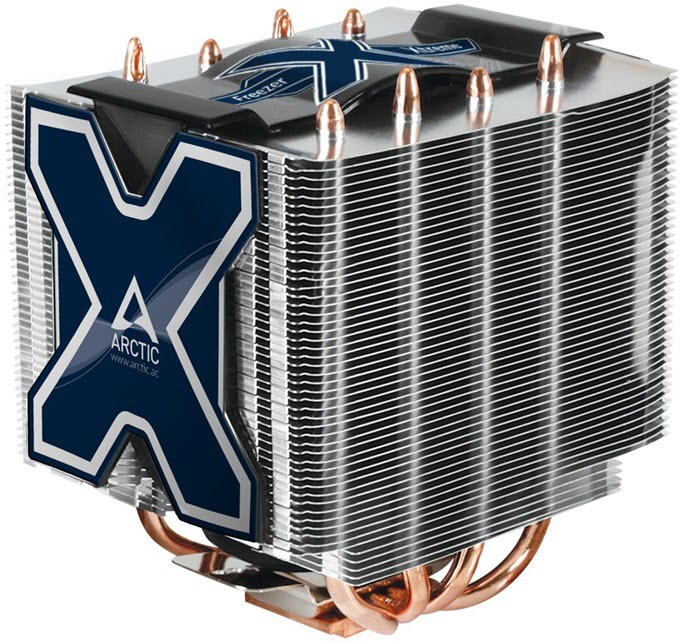 If you are looking for the best twin tower cooler under 50 dollars budget then you won’t find anything better than Arctic Freezer Xtreme CPU Cooler. In fact, I think this is one of the best CPU coolers under this price range. This is a big CPU Air cooler with twin tower heatsinks and it comes with a 120mm fan (centrally mounted) in the middle of both the tower heatsinks. This PWM fan comes with fluid dynamic bearing and spins at speed in range of 800 RPM to 1500 RPM. It is a silent fan that has maximum noise rating of 0.5 sone or 24.4 dBA at full speed. The CPU cooler comes with 4 double sided copper heatpipes that have direct contact with the CPU for better heat dissipation. Also, there is no need to apply thermal paste as it comes pre-applied with MX-2 thermal compound. Arctic Freezer Xtreme CPU Cooler supports wide range of Intel and AMD Sockets including AM4 Socket. The installation process is also quite simple with its push-pin mounting system. The performance of this CPU is great considering its price point and you can also perform decent amount of overclocking too, but not too serious. The height of the cooler is only 140mm but it is quite wide at 132mm, and you have to check the clearance on your motherboard and case before buying it. So, if you are looking for a powerful budget twin-tower CPU cooler that is quiet too then just grab it without thinking too much. FSP Windale 6 is unarguably one of the best CPU coolers that you can get under 50 dollars. Also, it is the most powerful CPU cooler in this list. The CPU cooler comes with black painted heatsink with six Copper heatpipes that have direct contact with the CPU for better heat dissipation, and thus cooling performance. It is accompanied by a PWM 120mm Blue LED fan that spins at speed in range of 600 to 1600 RPM. It is pretty silent at lower RPM but can get a bit on the louder side at full speed (32 dBA max. noise rating). The fan is fitted on the heatsink using the rubber screw assembly that minimizes vibration and also the extra noise. The heatsink position is not centered and a bit offset to one side, so that it does not interfere with RAM and provides enough clearance for RAM with taller heatsinks. Also, the CPU cooler looks quite good with black heatsink and white colored fan blades. The CPU cooler supports variety of Intel and AMD CPU Sockets including the AMD AM4 Socket. The mounting mechanism is quite easy and it is very sturdy too. You can use top-end processors like Core i7 and Ryzen 2700X comfortably with this CPU cooler without having to worry about the temperatures. The cooler is a bit a bigger and taller at height of 165mm, so be careful to check your PC case specs and clearance before buying it. You can do moderate amount of overclocking too, but make sure to use a good quality thermal paste for it. The model of this CPU cooler is AC601, and it is also available in White LED variant having model number AC602. Highly Recommended by me. 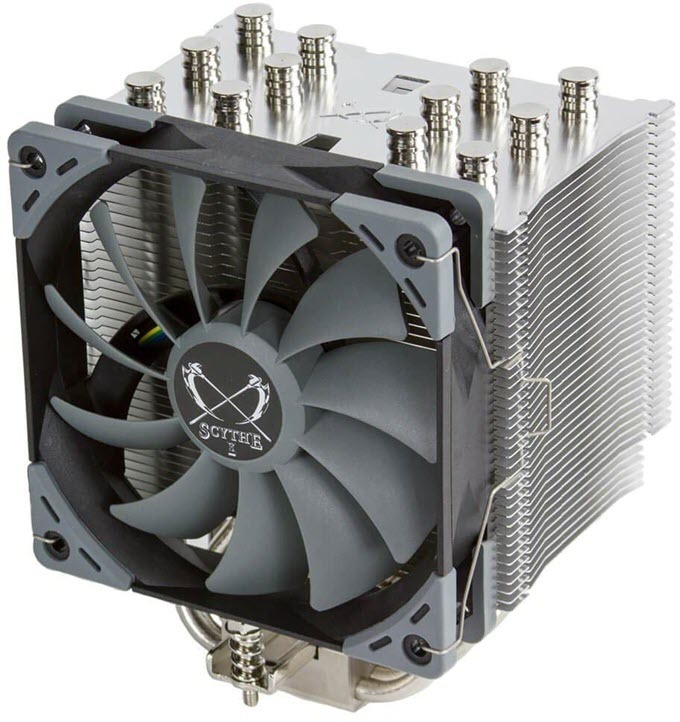 Scythe Mugen 5 Rev.B is a high performance CPU Cooler that you can get at 50 dollars budget. 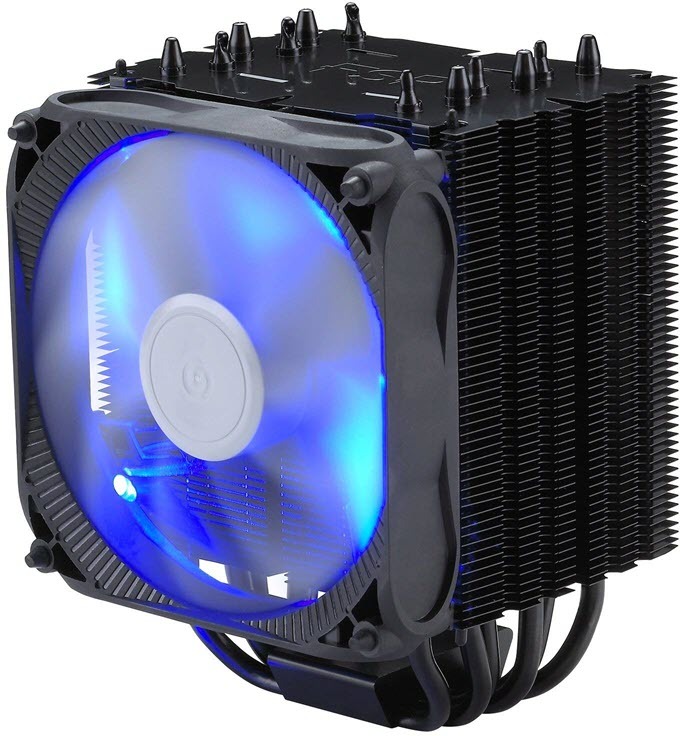 The performance of this CPU cooler is equivalent or even slightly better than the above mentioned FSP Windale 6 Cooler. 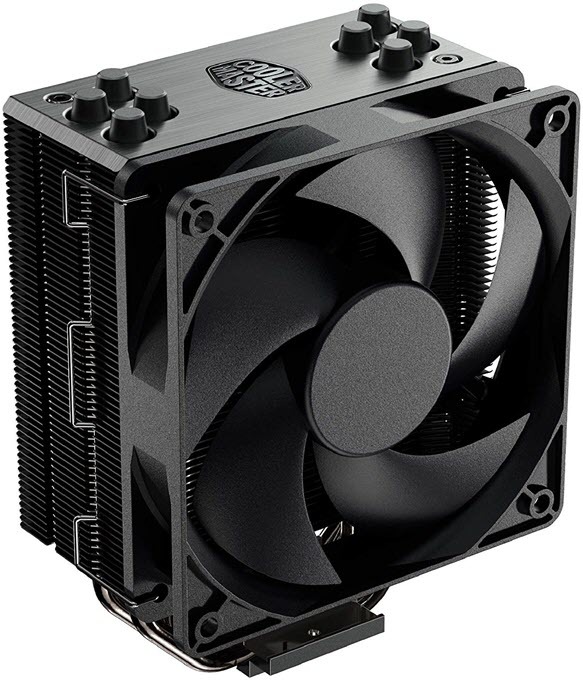 Scythe Mugen 5 Rev.B CPU Cooler is also very silent and is compatible with wide range of CPU Sockets including AM4, which it supports out of the box. The CPU cooler comes with heatsink with six copper heatpipes, and a copper base plate for maximum heat transfer to the aluminum fins. The asymmetric heatsink design and sloped heatpipes allow good amount of RAM clearance, even with taller heatsinks. The fan used with this cooler is Kaze Flex 120 PWM Fan, which is a quiet fan having maximum noise rating of 24.9 dBA only. The fan comes with Sealed Precision FDB (Fluid Dynamic Bearing) for longevity and reliability, and spins at relatively lower speed in range of 300 to 1200 RPM only. You can add another fan if you have enough clearance, and looking for extra cooling performance. The CPU Cooler is solidly built and does not feel cheap at all in terms of finishing too. The performance of this CPU Cooler is great for the price, and it even beats CPU Coolers that are one or two segments above it, in terms of price, that even includes some AIO coolers. This CPU Cooler works great with Ryzen processors (Ryzen 7 / 5 /3), and offers far better performance over the AMD’s Wraith Stock cooler, and the highly popular Cooler Master Hyper 212 Evo CPU Cooler. You can also do some amount of overclocking too, and still be able to run the processor stable at high speeds without throttling down. The CPU Cooler uses H.P.M.S. II (Hyper Precision Mounting System II) that allows for pretty easy and simple installation, for both Intel and AMD processors. The height of the CPU Cooler is 154.5mm, which is not too tall, and it can fit in most of the mini-tower and mid-tower cases. So, if you are looking for powerful budget CPU cooler for your mid-range or high-end CPU then just grab this baby right now. Highly Recommended by me. At the end I would like to say that these budget CPU coolers delivers top cooling performance and supports all the latest Intel and AMD processors including Intel Kaby Lake, 8th generation, 9th generation and AMD’s Ryzen processors (AM4 Socket). They are super cheap and some of them can fit in smallest of the cases. If you have queries, then feel free to ask me leaving a comment below. Do you know cryorg h7 comes with am4 bracket support out of the box? Or did you have to contact them do be able to get it? You have to contact them for AM4 bracket and they will send it for free. Overall which one would you choose: Cryorg h7 or CM MA410P? IMO I’m slightly favored to CM due to it comes am4 support natively on cryorig i have to ask for upgrade kit. Yes it is always better to have the bracket included but when it comes to performance then Cryorig H7 is definitely better. However if you don’t plan on overclocking then CM MA410P will serve the purpose well.